I was really in no mood to play in the 1975 Australian Open, which began in the last week of ’74 at Melbourne’s Kooyong. I wanted to relax and have fun with family and friends over Christmas, and for some time, I’d been arguing the point with the organisers of the Open. Many players were skipping the event because they refused to sacrifice Christmas. I argued that if only it could be put back a few weeks, till the end of January, there’s be a stellar list of competitors. I told tournament director John Brown that I wouldn’t be playing. I was jaded, I wasn’t motivated, and not having played in a tournament for nearly two months I was rusty and about 4 kilos overweight. I told Brown that the only thing that could make me reconsider would be if Jimmy Connors was competing – and I was sure he’d be giving the Open a miss. Then, 11 days before the tournament, Brown rang me and said that Connors had decided to play, and asked whether this changed my decision. ‘Give me an iron-clad guarantee that Jimmy is definitely going to be there, and I’ll sign up right now,” I replied. Jimmy was coming, and it was on: the tennis championship of the world. I struggled throughout the early rounds of the Open. In spite of my training regimen, I was uninspired and inconsistent. My fans despaired as 19-year-old German rookie Rolf Gehring took me to five sets in the second round. I was not playing well, but I was winning. At the end of the first week, there was some rain, so the second half of the Open was concertinaed into three days, with the final of the singles to be played on New Year’s Day. I played Geoff Masters in the quarterfinals and he had me down two sets to one before I beat him 10-8 in the fifth. Then I played a doubles quarterfinal with Tony Roche, which we won, and the next day I had to face Tony in the singles semifinal. This was a gruelling program, so before I played Rochey, I went to see Stan Nicholes, our old Davis Cup trainer, and he massaged my legs for two hours, pushing all the lactic acid out of them, and when I squared off against Tony I felt good. I needed to because this match was probably one of the hardest I ever played. As mentioned previously, Tony and I had a habit of going all out against each other, and this was no exception. Again, the match went to five sets. At one point in that deciding set, Tony had me 5-2 down. Then, somehow, I finished up beating him 11-9 in what became a marathon. But really, all I wanted to do was cry. That exhausting semi had taken me somewhere my brain and body had never been before. Like the true friend he is, Rochey didn’t hesitate to let me off the hook. Next, I returned to Stan and he pummeled my legs for another two hours. After that, I had the quietest New Year’s Eve of my life. On 1 January 1975, I woke feeling fresh and not hurting too much, considering. 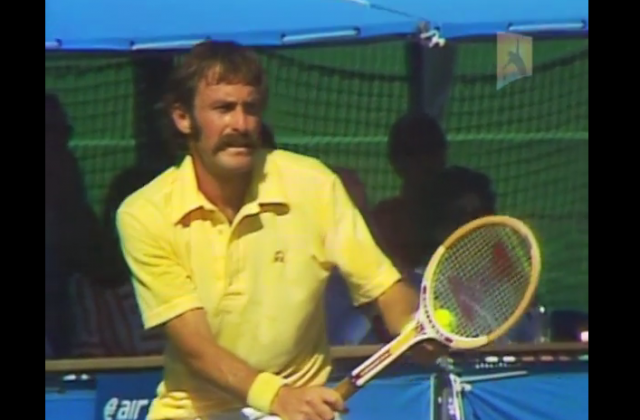 I jogged 2 kilometres to loosen up, then went to the courts to play Jimmy Connors. I wasn’t intimidated by him. Perhaps I should have been? The man who had been likened to boxer Joe Frazier – ‘he keeps coming at you’ – had waged a brilliant Open campaign, thrashing all comers on his way to the final. He was an unbackable favourite with the bookies, but not the crowd. Connors and I played probably the greatest, certainly the most intensely fought, Australian Open final ever. It was a blazing hot day, the flies were terrible, the atmosphere electric and the crowd noisy and parochial, yet of my life so focused was I that I could have been playing on the moon. I knew I was in for the fight against a skilled and implacable opponent who’d destroyed everyone who’d crossed his path. Also, at 30 years of age and having just played that killer match against Tony, I wasn’t sure if my body could take it. I had to put myself into the zone and be in tune with everything that was happening inside me. Against all the predictions, and to the delight of the fans, I won the first set 7-5, which led one character in the crowd to yell at Connors ‘What happened Mouth?’ Jimmy then broke me in the second set and easily held his service to win 6-3. In the third I broke him, then he broke me, then I broke him again to win 6-4. That first break has gone down as a memorable moment in Australian tennis history. With Jimmy serving at 0-15 and me leading 3-2, three contested line calls in a row – the third one an ace – gave him a 40-15 lead. I was angry, and the crowd was angry, booing and catcalling at the injustice they reckoned I’d copped. Then Jim did an odd thing: he deliberately double-faulted in an attempt to pacify the crowd. It worked. The fans, so against Connors right through the tournament, suddenly cheered him for his good sportmanship. But he’d let me back into the game and I took ruthless advantage of what I considered was his patronising and overconfident benevolence. I couldn’t believe what he’d done. I’m all for playing fair, but not to the point of martyrdom. Every player gets bad calls and you have to live with them. In the fourth set, I was on top 5-3 after a few aces (I served 17 in that final) and was serving for the match. At this stage I had some energy left but I was starting to feel totally buggered. Normally I’d train two to three months for a Grand Slam event and, having put in the hard work, my condition would always see me through. But this time, with just 10 days training under my belt, I was way underdone. From the first point of the final, I conserved every ounce of energy. I didn’t smile a lot, didn’t show much emotion. Between points I walked slowly and calmly and breathed deeply. I knew Jimmy would take me to the wire and I prayed I had enough left to accomodate him. After the match I was euphoric, and embraced Angie and the kids. It was an emotionally charged presentation at courtside, and not only because of the classic match Jimmy and I had played, or Evonne Goolagong‘s win over Martina Navratilova so soon after the death of Evonne’s dad, Ken, in a car accident. Just a week before the fianl, Cyclone Tracy had levelled Darwin, and the nation was bruised and hurting? I auctioned my racquet for $1400 to benefit Darwin’s homeless and then, even though I was wrecked, I played a fundraiser exhibition match at the Hodern Pavilion to raise more money.